If you’ve visited wpcharitable.com in the past, you may notice that we recently made some significant changes to the site! This may not seem like a big deal, but for us it was a long time coming! We’ve been planning the overhaul of the site for most of this year, so we’re taking a moment to celebrate (and to let you know what we changed, and why)! When we launched Charitable back in 2015, we needed a website but we were still building the product. There were a lot of things we didn’t know, so we built a simple, functional website that served us well for two years. While it did the job, it was lacking in many ways and needed an overhaul. We completely redesigned the site from the ground up, including typography, colour palette, and logo. Our homepage now gives a much better overview of Charitable’s features, including those provided in our paid extensions. The Pricing page is now clearer and easier to navigate. Our customers expressed confusion about our Pay What You Want (PWYW) pricing, so we have removed PWYW for the Plus and Pro packages. This reduces confusion and simplifies the purchasing experience. We added a third package – Starter – with PWYW pricing to help make our simpler extensions more affordable and accessible. Purchasing a product is now much easier thanks to our redesigned Checkout. Our new Themes page lists themes with specific integration for Charitable. We also have a 3rd Party Extensions page which lists Charitable integrations built by other developers. We also made the site faster, on the front and back end. As a designer, I (Wes) was able to do all of this using Beaver Builder – my favourite page builder plugin. I also used Beaver Themer, which allowed me to push ahead with designing and developing the website without needing to custom-code templates. A major feature of our old Pricing page was our Pay What You Want (PWYW) pricing. The goal was to make Charitable accessible to even the smallest nonprofits. We set a minimum price, but allowed customers who could afford it to pay a little more to support the future development of Charitable. Of course, $249 is still a significant investment for non-profits with small budgets, and particularly those in less wealthy countries. For some customers, the Pay What You Want model resulted in confusion, and some were apologetic because they could not afford more than the minimum. That’s the last thing we wanted customers to feel! So we decided to drop the Pay What You Want pricing model on the higher end Plus and Pro packages and fix their price at what was previously the minimum price ($99 for Plus, and $249 for Pro). With a 50% discount on renewals, this is still a competitive price for the amount of functionality included. At the same time, we noticed that some of our simpler and cheaper extensions were not being purchased individually. 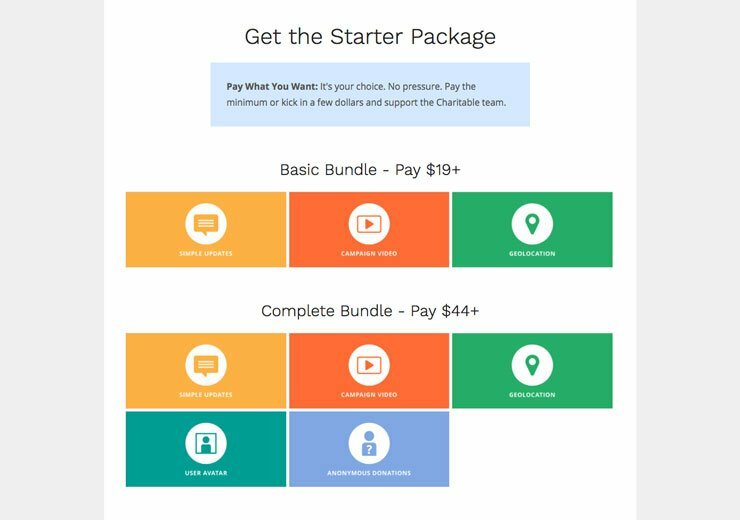 In order to make them more accessible to non-profits who are just starting out, we decided to add a third package called Starter which retains the Pay What You Want model and comes in at a minimum price of $19. The Starter package includes our Geolocation, Simple Updates and Videos extensions for any purchases over $19, and adds the Anonymous Donations and User Avatar extensions when you pay over $49. In the next few weeks we will have one more extension to add to the Starter package: Donor Comments. Stay tuned for that one! Just like the website, our old logo served us well, but was designed before the product was even finished. The redesign of our website seemed like the perfect time to review the old logo, to see if it fit with the new direction we are taking. We decided to evolve the logo rather than redesign it, in order to maintain some of the previous brand equity, but streamlining it and giving it a more sophisticated feel. The goal was to update the logo without anyone really noticing. Did we succeed? We hope you enjoy using our new site, and if you have any suggestions or notice any bugs, please let us know.